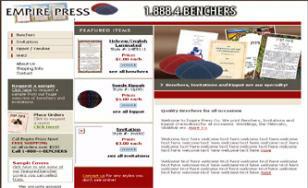 Empire Press prints benchers, invitations, kippot and prayer books. This business, located in Brooklyn, NY, wanted to enlarge its customer base. For customers who are interested in this type of business, this type of merchandise may not be available in the cities where they live.Empire Press choose Bitochon to create an Ecommerce website so that they could offer its products to customers nationwide. Shoppers can browse the many different varieties of each product, including the most popular, and also personalize them. Customers also can request samples of benchers and invitations and place orders using a credit card. The Ecommerce website development allows Empire Press to add or change merchandise as needed without the assistance of a programmer.